No, because a movie is a very different storytelling format from a novel and it has to be changed in order to be doable at all. Movies are more visual, more externalized, and also generally much shorter. Not to mention more superficial. A movie that were just an exact copy of a book would surely be inferior to the book itself. It also wouldn't work very well as a movie because of the major differences in the formats. And I'm not talking as a writer, but as a reader. Quite frankly, as a lifelong reader and lover of books, I've always been offended by the attitude that the experience of a book is somehow incomplete or inadequate unless it's turned into a movie, as if movies were intrinsically of greater worth. If I love a story as a book, then I want it to be a book. It has value in its own right; it's not just a movie waiting to happen. If there's a story I love as a novel, I'll reread the novel. I don't need a movie crew to make a verbatim adaptation of the book, because I can do that in my own head when I read it. I've already had that experience. I want a movie to add something new and distinct to that experience, something beyond it, otherwise what's the point? The weakest Harry Potter movies are the first two, precisely because they're the most slavish, just unimaginatively dramatizing the letter of the books' plots and failing to capture their underlying spirit and sense of wonder. Being just copies makes them lifeless and hollow, mere mechanical exercises in transcription. The better Potter movies are the ones that take more liberties, that bring more imagination and novelty and thereby capture the feel and essence of the books rather than just their surface text. The movies of The Hunger Games are pretty faithful to the books' stories, but they had to tell them in a rather different way because they couldn't be as internalized as a first-person narrative. So they tell the story from a more external perspective and thereby give us parts of the story we didn't get in the books, events from the perspective of other characters when Katniss wasn't around. They're mostly faithful to the plots, but they add more that wasn't there before -- they do what the books couldn't by showing the larger world, just as the books did what the movies couldn't by showing us Katniss's inner thoughts. That way, the books and the films complement each other, each offering aspects of the story that the other doesn't. That's so much better than just covering the exact same ground twice. ^It was the same with True Blood, the books were all first person from Sookie's perspective, so all of the scenes and stories involving the other characters were added for the show, and I think the expanded scope helped. The book is always superior to the movie. On that, we agree completely. "Always" statements are never wise. I've seen movies I enjoyed more than the books they were based on -- for instance, Who Framed Roger Rabbit? is a much, much more entertaining and conceptually coherent story than Who Censored Roger Rabbit? And the film version of Jaws is widely considered superior to the novel it's based on. What I'm saying is I object to the tendency to think "Gee, what a great book -- it should be a movie." That's devaluing the book as a thing in itself, and it's self-contradictory and illogical to say "I like the thing in this form so it needs to be changed into something else." ("Gee, what a comfortable pair of shoes -- I should turn them into a hat!") If you think something was a great book, then appreciate it as a book. Whether it becomes a movie is a separate question altogether. That doesn't mean a movie can't be better than the book it's based on. Some bad books get turned into good movies. Some good books get turned into great movies by great directors. But it means that movies are not replacements for books. It's not like a book is a caterpillar destined to enter a chrysalis and become a movie. The book is its own entity, and a movie based on it is a distinct work, a distinct approach to its ideas. And that means it's not in competition for the same niche, so it's unnecessary to reduce it to "the book is better than the movie" or vice-versa. They're just different. Either one can be better, or they can both be good in different ways. Yeah, and some are worse than others... like Fantastic Four. That's kind of what I thought, since it seems to be a spinoff of another show. I wonder what the idea was behind that retro promo. Although it certainly got my attention. Quality is always the most important thing. Sleepy Hollow is one of my all-time favorite shows and look how far off the beam they were with that. It always nags at me, though. Another example is SHIELD, which I love-- but to me is a standalone adventure show that annoyingly recycles names from the Marvel Universe. I thought that Christopher Nolan’s The Prestige was way better than the book. The LOTR movies also improved on the books in many ways (the Hobbit not so much). There was something else that came out recently where I actually eneded up liking the movie or TV show quite a bit more than the book, but I cannot remember what it was. 'The Expanse' leaps to mind. The books were good, but rather than just dogmatically follow them, the show took advantage of the fact that they had several books worth of foreknowledge and baked certain characters and subplots from later instalments into the first season so they weave a lot more naturally into the narrative and don't just drop in and out of the narrative quite as jarringly. They also took the opportunity of having to visualise the story to knuckle down and get a lot deeper into the world building than even the books did. So yeah, anyone that claims that adaptations are inherently inferior to the source material, hasn't read that many adapted books. The Godfather is a much better movie than a book. I've never seen Jaws all they way through. But I did read the book (well the Reader's Digest version that my parents had) From what I saw, the movie was better. And it's worth noting that the authors of the books are members of the show's writing and production staff, so they're participating in and approving the changes being made to their own work. Fans often think that changing an author's words is some kind of blasphemy or offense against their perfect creation, but authors know that their work is the end result of a long process of trial and error and change, and they'll usually jump at the chance to make improvements in their work after the fact, or experiment with alternative ways of retelling a story (since it would be boring to do it exactly the same way twice). With the Expanse, I do enjoy the series more than the books, but for my first run through, I didn't complete the first season. I read the first couple of books while on holiday and then that got me back into the series. Odd that the Chief sounds about eleven years old. The joke is that the cartoon is done in the style of Teen Titans GO! and has the same voice cast using the same voices they use for the Titans. 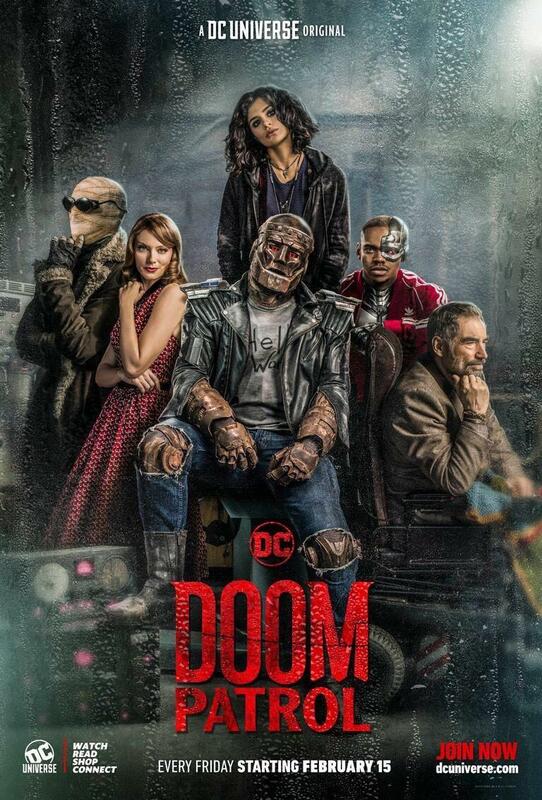 So Greg Cipes reprises Beast Boy, the Chief has Scott Menville's Robin voice, Elasti-Girl has Hynden Walch's Starfire voice, Robotman has Khary Payton's Cyborg voice, and Negative Woman has Tara Strong's Raven voice (which is why it's Negative Woman instead of Negative Man). I think Mento was also Menville doing a different voice, since there's no TTG counterpart for him. Ovation, Captaindemotion and Nerys Myk like this.